UPDATED: April 15, 2018 at 2:03 a.m.
A black Harvard College student was arrested Friday night after a physical confrontation with law enforcement for charges including indecent exposure, disorderly conduct, assault, and resisting arrest, according to information posted Saturday by the Cambridge Police Department.In response to the event, the Harvard Black Law Students Association posted a tweet calling the arrest of the student an incident of police brutality. 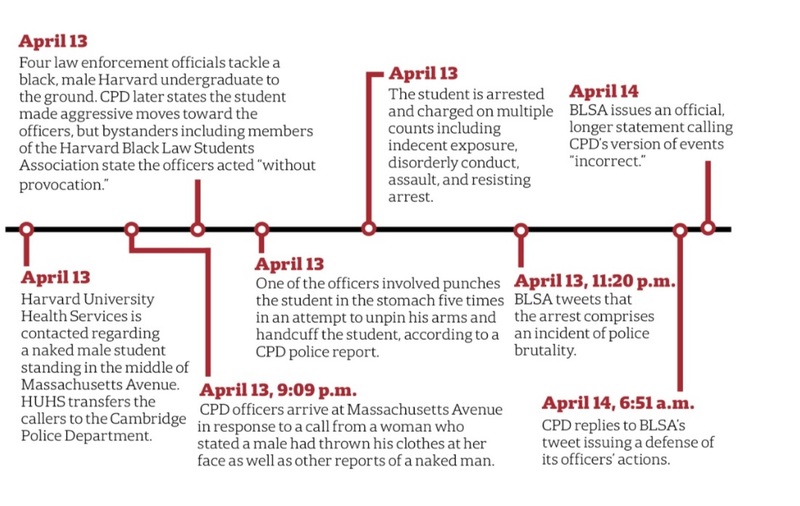 BLSA also later posted a statement on its website calling CPD’s version of events—published on social media—”incorrect.” Members of BLSA, who wrote they videotaped the incident, wrote in the statement they saw the student, naked and unarmed, surrounded by at least three Cambridge Police Department officers. In an unusual move, the police department tweeted a lengthy explanation of the arrest in direct response to BLSA’s tweet. According to CPD’s tweet, officers arrived at the intersection of Massachusetts Avenue and Waterhouse at around 9:09 p.m. last night in response to “a call from a woman who stated a male had thrown his clothes in her face” and six other reports of a “completely naked” man. The CPD wrote in its tweet that officers “located and verbally engaged” the student, who was standing on a traffic island in the middle of Mass. Ave. Officers learned from the student’s acquaintances that he previously “took narcotics,” which “could have a hallucinogenic effect when ingested,” according to the tweet. The officers and the student then engaged in a physical altercation, according to the tweet from the CPD. “While on the ground, at least one officer repeatedly punched the student in his torso as he screamed for help,” the statement continues. The CPD tweet states that three officers from Cambridge Police and another officer from Transit Police “were required to gain compliance from the male” and place him in handcuffs. The student was subsequently transported to a local hospital for an evaluation, and, while in transit, spat “a mixture of blood and saliva at an EMT,” according to the tweet. The BLSA statement notes that “a pool of blood remained on the pavement” as the ambulance departed. The student is currently under arrest and is facing charges of “Indecent Exposure, Disorderly Conduct, Assault, Resisting Arrest, and Assault and Battery on an Ambulance Personnel,” according to the CPD tweet. CPD spokesperson Jeremy Warnick elaborated on the department’s account of events in an emailed statement Saturday afternoon. Late Saturday night, Warnick emailed The Crimson a copy of the full police report detailing the sequence of events Friday. The report elaborates on the account of events presented in the tweeted statement. After assessing that the student “could not be reasoned with,” one officer grabbed the student’s legs in order to bring him to the ground, according to the report. In a statement sent to Cambridge City Councilors following the arrest, Cambridge Police Commissioner Branville G. Bard, Jr. described the arrest and specifically discussed the five punches the CPD officer delivered to the student’s stomach. Bard wrote he had received questions and concerns from “select members of the community” and that “the primary concern” centered on these punches. The BLSA statement argues that other Harvard resources should have “been mobilized to come to the student’s aid prior to CPD getting involved.” In particular, the statement notes that Harvard University Health Services were contacted first—but that HUHS transferred the callers to CPD. The department failed to “appropriately respond to the individual needs of the person concerned” by “resorting to violence unnecessarily and with impunity,” the statement reads. The statement further states that HUHS put the student “at great risk of being killed by the police” by choosing to involve CPD. Harvard University Police Department spokesperson Steven G. Catalano said Saturday that HUPD was “aware” of the call. “Officers responded, but when they arrived the suspect was already under arrest,” he said. The BLSA statement makes several demands in the wake of the incident, including that the officers involved in the arrest be “investigated and held accountable” and that Harvard create an “internal crisis response team to support” affiliates that “does not involve CPD.” The statement calls on Harvard to offer “support from the school, fellow students and our instructors” to “put pressure on the CPD” to comply with BLSA’s demands. The statement further demands that CPD respect the rights of civilians to record police conduct. CPD’s own policies recognize that individuals have the “right under the First Amendment to openly record police activity in public in a peaceful manner,” according to the statement. A Harvard Law student tweeted out what appeared to be a video record of the arrest over the weekend, but later deleted that video. “We are reminded, as soon-to-be-graduates of an elite law school that we cannot protect our bodies with our degrees—and that is why we also call our current students and alumni to embrace these demands as inclusive to all Black people, not just Harvardians,” the statement reads. CPD plans to hold an “internal review” of the incident given “use of force was required to gain compliance” from the student to “avoid further injury to himself,” according to the police department’s tweet. The review will be conducted by the department’s leadership and by its Professional Standards unit, according to the tweet. As a matter of policy, CPD conducts such internal reviews whenever officers use force. “Because the police department carries an affirmative burden to demonstrate that the exercise of force was necessary and appropriate, the department must conduct a complete and thorough review of all such incidents,” the department’s 2011 policy reads. Cambridge City Manager Louis A. DePasquale wrote in a statement to City Councillors over the weekend that he believes the outcome of the review will allow CPD to learn “lessons” from the arrest. “I know that the Cambridge Police Department takes great pride in serving and protecting the City of Cambridge,” DePasquale wrote. Roland S. Davis, the College’s associate dean for diversity and inclusion, addressed the incident in an email he sent to College students Saturday afternoon. Davis held a gathering for College affiliates Saturday afternoon at 4 p.m. in the Phillips Brooks House Parlor Room. BLSA held a gathering in Wasserstein Hall at the Law School at 5:30 p.m. Saturday evening to discuss the incident. Friday’s incident coincided with the night of Yardfest, the College’s annual outdoor spring concert. A previous version of this story indicated Harvard Black Law Students Association had released a public statement in response to the Cambridge Police Department’s lengthy explanatory tweet and quoted some erroneous information contained in that statement. In fact, the document originally referenced in this story was a draft letter being circulated internally by BLSA; the draft contained some incorrect information regarding CPD’s videotaping policies. CPD does not, in fact, have a policy requiring its officers to wear body cameras. After BLSA released its official statement Saturday evening, Crimson editors updated this article with the final statement.